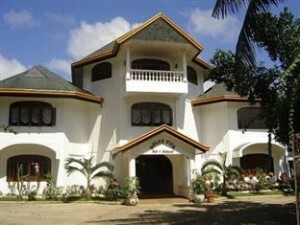 The 3-star Eagle Point Resort offers comfort and convenience whether you’re on business or holiday in Batangas. The hotel offers guests a range of services and amenities designed to provide comfort and convenience. Take advantage of the hotel’s Wi-Fi in public areas, business center, bar/pub, car park, concierge. Each guestroom is elegantly furnished and equipped with handy amenities. The hotel’s peaceful atmosphere extends to its recreational facilities which include water sports (non-motorized), pool (kids), massage, tennis courts, water sports (motorized). Friendly staff, great facilities and close proximity to all that Batangas has to offer are three great reasons you should stay at Eagle Point Resort. Stop at Prestigio Hotel Apartments to discover the wonders of Cebu. Featuring a complete list of amenities, guests will find their stay at the property a comfortable one. Facilities like elevator, Wi-Fi in public areas, laundry service/dry cleaning, business center, smoking area are readily available for you to enjoy. Each guestroom is elegantly furnished and equipped with handy amenities. The hotel offers various recreational opportunities. Prestigio Hotel Apartments combines warm hospitality with a lovely ambiance to make your stay in Cebu unforgettable. Dolphin House Mactan Apartments is perfectly located for both business and leisure guests in Cebu. Offering a variety of facilities and services, the hotel provides all you need for a good night’s sleep. Facilities like car park, tours, poolside bar, shuttle service, airport transfer are readily available for you to enjoy. Shower, mini bar, internet access – wireless, air conditioning, hair dryer can be found in each guestroom. To enhance guests’ stay, the hotel offers recreational facilities such as garden, outdoor pool, pool (kids), private beach, jacuzzi. Convenience and comfort makes Dolphin House Mactan Apartments the perfect choice for your stay in Cebu. City Suites Ramos Tower is conveniently located in the popular Cebu City area. The hotel has everything you need for a comfortable stay. Facilities like concierge, business center, 24hr room service, restaurant, meeting facilities are readily available for you to enjoy. Designed for comfort, guestrooms offer balcony/terrace, shower, complimentary bottled water, refrigerator, air conditioning to ensure a restful night. The hotel offers various recreational opportunities. A welcoming atmosphere and excellent service are what you can expect during your stay at City Suites Ramos Tower. Set in a prime location of Cebu, Premiere Citi Suites puts everything the city has to offer just outside your doorstep. The hotel has everything you need for a comfortable stay. Take advantage of the hotel’s elevator, coffee shop, restaurant, meeting facilities, laundry service/dry cleaning. The well-appointed guestrooms feature refrigerator, mini bar, non smoking rooms, satellite/cable TV, shower. The hotel offers various recreational opportunities. Discover all Cebu has to offer by making Premiere Citi Suites your base. The 2-star GV Hotel LapuLapu Cebu offers comfort and convenience whether you’re on business or holiday in Cebu. The property features a wide range of facilities to make your stay a pleasant experience. To be found at the hotel are car park, Wi-Fi in public areas. Each guestroom is elegantly furnished and equipped with handy amenities. The hotel offers various recreational opportunities. Discover all Cebu has to offer by making GV Hotel LapuLapu Cebu your base. Escario Central Hotel is conveniently located in the popular Cebu City area. The hotel offers guests a range of services and amenities designed to provide comfort and convenience. Car park, business center, Wi-Fi in public areas, airport transfer, laundry service/dry cleaning are on the list of things guests can enjoy. Guestrooms are fitted with all the amenities you need for a good night’s sleep, including non smoking rooms, television, air conditioning, complimentary bottled water, satellite/cable TV. Take a break from a long day and make use of garden, massage. Escario Central Hotel combines warm hospitality with a lovely ambiance to make your stay in Cebu unforgettable. The 2.5-star Hotel Casablanca offers comfort and convenience whether you’re on business or holiday in Cebu. The property features a wide range of facilities to make your stay a pleasant experience. Wi-Fi in public areas, coffee shop, car park are just some of the facilities on offer. The well-appointed guestrooms feature satellite/cable TV, internet access – wireless, coffee/tea maker, air conditioning, television. Access to the hotel’s garden will further enhance your satisfying stay. For reliable service and professional staff, Hotel Casablanca caters to your needs. Stop at Chateau De Carmen Hotel to discover the wonders of Cebu. Both business travelers and tourists can enjoy the hotel’s facilities and services. Service-minded staff will welcome and guide you at the Chateau De Carmen Hotel. The well-appointed guestrooms feature internet access – wireless (complimentary), air conditioning, balcony/terrace, shower, internet access – wireless. The hotel offers various recreational opportunities. No matter what your reasons are for visiting Cebu, Chateau De Carmen Hotel will make you feel instantly at home.